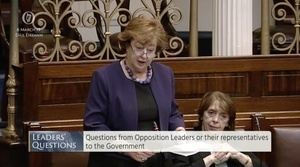 Social Democrats TD Catherine Murphy repeatedly asked the Taoiseach Leo Varadkar if it’s true that Dublin City Council only built 21 social housing units last year. 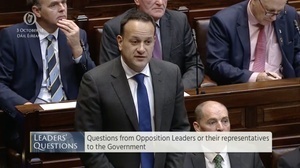 Mr Varadkar appeared to confirm the figure when he said that a breakdown of social housing figures is available, he has seen the figures, and “I imagine that that is correct”. But his answer came after some time. 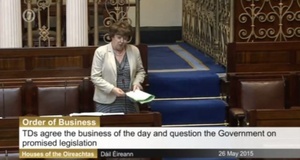 Ms Murphy is a member of the Public Accounts Committee and recalled a recent meeting of the committee involving the Housing Department’s Secretary General John McCarthy whom, she said, stated “quite categorically” that the figures for council housing are extremely clear in terms of the breakdown/categorisation of these properties. She said Mr McCarthy said the department publishes “quarterly updates in this regard” and he “refuted allegations of spin when it comes to the presentation of the figures”. “In 2018, the social housing output figures, under local authority build, the number is listed as 2,022 but the minister has bundled all of those categories and has consistently refused to give a breakdown of local authority build by individual category. “However, at the Public Accounts Committee meeting last week, the secretary general [Mr McCarthy] in response to questions I posed, finally gave us a breakdown of the figures for 2018. “Those figures: 768 for turn-key units, 200 regeneration properties and that leaves a total of a 1,054 actual newly built local authority houses for 2018. 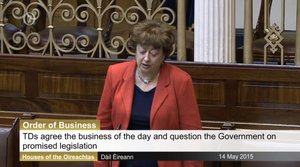 Ms Murphy said that a few weeks ago Minister Murphy, on RTÉ’s Morning Ireland, Dr Gavin Jennings “grilled” the minister for a breakdown of the social housing output but his questions went unanswered while the minister said the figures would be available the following week. But, Ms Murphy said, these figures still haven’t been made public, outside of being made available to the Public Accounts Committee; they’re not on the department’s website; and they’re not in the department’s press releases. The Social Democrats co-leader then asked if the reason for the “reluctance” to give a clear breakdown of the output is that some councils are performing “very poorly”? 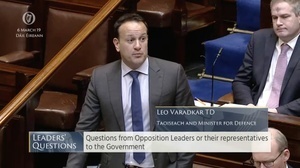 “So, Taoiseach, can we get some straight answers to the following questions please? “Can you confirm that the new builds by local authorities, given to the Public Accounts Committee, by the Secretary General last week, are accurate? “Is it correct that Dublin City Council only built 21 units in 2018 themselves? In his response, the Taoiseach said people receiving homes don’t ever raise the categorisation of social housing. Ms Murphy said knowing the breakdown does matter. She said knowing the breakdown allows people to know what’s cost effective and value for money. “We need to get those breakdowns so that information can be evaluated. This is public information, it’s public money. Why are you so reluctant to give the figures in a way that breaks it down and you can make those comparisons? “Is it true that Dublin City Council built 21 houses last year? The performance of our local authorities matters because they’re going to be the ones that are going to deliver, if we’re actually going to deliver the kind of numbers that are needed, to actually get a grip on this crisis. “Deputy, I’m advised by the minister of state behind me that those figures are available and I’ve seen breakdown so I imagine that that is correct and they are available. “But I think you’ve got it wrong here. The truth is, after years of running into problems, years of delays, when we didn’t have the money to do it, after years and years of trouble, we’re now delivering on social housing, increasing the housing stock by 9,000 last year. 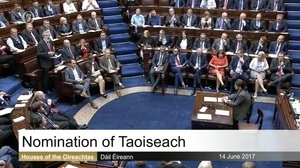 Posted in Misc and tagged Catherine Murphy, Dail, Housing, Leo Varadkar at 1:11 pm on March 6, 2019 by Bodger. Knocked Varadkar off his Pontoon alright. She and others like Wallace and Daly are the true opposition in this country. That one sentence that contained those words really says it all. He sees something, and he just imagines what he has seen. Himself and Enda Kenny competing for the failure of the decade award. As Taoiseach he would sees tens/hundreds of memos/letters/emails each week. I read this as he is acknowledging that yes he saw that memo, but he can’t recall the exact details of the memo – but the number she is proposing seems right. He can’t recall anything that paints him and his party in a negative light. He’s not a leader, he’s never earnest, always spinning, can’t admit to mistakes, completely uninspiring. I don’t know what the hell he is, but deffo NOT a leader! And Leo’s little apologist surfaces bang on time. Great to have the use of a split tongue. This is the data from the Department of Housing that Catherine Murphy was questioning, it appears to show Dublin City Council building 137 homes for social housing in 2018 (it says “local authority housing 2018 new build” so you can see why you might think that!). But exclude the ones which they “regenerated” (which might be the replacement of mouldy sealant around a bath) and focus on the true “new build” and Catherine seems to think they built just 21. FG TDs have been going around the radio studios for the past fortnight giving us the impression local authorities around the country built 2022 units in 2018. That is a load of poo and Catherine Murphy is exposing it (and being attacked by Leo for saying something which she hasn’t). Don’t give up, you know you’re winning when they blatantly attack you for asking a simple question. Do you have any evidence that “regeneration” might include fixing a bath seal? or is that just in your head? Wow! Now there’s a Master Class in under achievement. 21 Houses in a year! Take a bow FG, you earned it. The people crying about the government not building social houses are the same people crying about the cost of the children’s hospital. The fewer houses our politicians and civil servants build the better. They have zero competence in delivering construction projects. And the lads in the local authorities are the worst of all. Older readers might remember some of the jokes from the George Redmond days. If these clowns start building social houses we’ll end up with the most over-priced and slowly built homes in the world. If Leo recognises that, more power to him. Let the private sector build. The State can buy finished units on the open market afterwards. Yes, the market is doing a wonderful job. 21 houses is absolutely shocking. The years of FG’s “the free market will sort it” obsession need to come to an end. Great work from Catherine Murphy as usual as well. I’m not a big SocDems supporter but she really does perform an invaluable service to the state. Who runs Dublin County Council? You are well aware that local government in Ireland is among the most centralised in the EU and local authorities have little to no powers and tiny scope for raising revenue. Local authorities simply implement government policy. I don’t know how the other councils performed. I’ll tell you what. When the figures of how many units that each LA built in 2018 are published (as i assume Catherine will have a PQ in ASAP) we can answer this. If all LAs have really low numbers of own-builds – I’ll agree that it is a government policy issue. However, if some of the LAs have high numbers of own-build, will you admit that the problem lies with some LAs rather than central government? All 31 local authorities performed poorly, it is nothing to do certain political parties being in control of Dublin City Council so you can stop spinning. The Executive of local authorities implement government policy and Councillors have little role in same. And yet in recent years, DCC have voted twice to defund themselves even further by voting to reduce LPT by the maximum allowable amount. The LPT makes up approx 25% of the Local Government Fund. & the Local Government Fund is only 1 of 4 funding streams for local authorities (you still have Rates, Charges for Goods & Services and Specific Grants). DCC tinkering around with the LPT is not the reason why Dublin is failing to house those who live there. LPT and rates. Who do you think finances them?